From December 6-8, 2013, the XXV IWA Congress took place in Valencia, Spain. Around 150 people took part in the Congress, with delegates coming from France, Germany, Italy, Spain, Portugal, Great Britain, Australia, Brazil, Argentina, Norway, Serbia, Poland, Russia and Slovakia. Observers also came from the FIJL – the Iberian Federation of Libertarian Youth. Towards the beginning of the Congress, we welcomed new organizations to the IWA: the Autonomous Workers' Union of Bulgaria and the FAS from Austria. The status of the Australian Section was also settled. With these new organizations welcomed to the International, we proceeded with a long list of internal and practical issues. 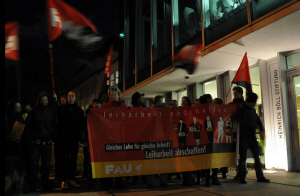 The FAU delegation had to walk out of a meeting with the Heinrich Boll Foundation on October 11th. The meeting took place after the verdict issued by a Berlin court in September, which stated that the Foundation had used temporary workers illegally and that one of the plaintiffs was in fact a worker directly employed by the Foundation. The meeting was supposed to bring an out-of-court settlement regarding the compensation of the worker already recognized by the court, as well as the status of the remaining workers seeking recognition as direct Heinrich Boll Foundation employees. Only a few minutes into the negotiations it became clear that the FAU had no other choice but to end the meeting. The managers of the Heinrich Boll Foundation refused to recognize the base union as a partner of negotiations representing the interests of it's members. Instead, the managers wanted to talk with each of our colleagues separately. This strategy was meant to undermine the function of FAU as a union. The day after the general strike, we can say that it was a good choice to take part in local initiatives. Below are some comments, pictures and video from various cities. Some reports from various locations. It was an excellent day in Cosenza . 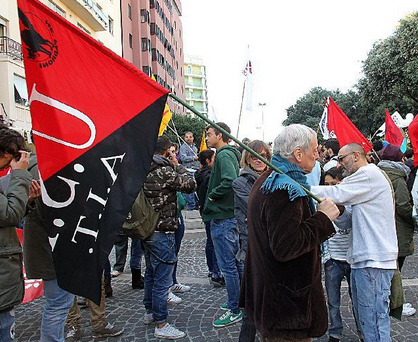 The USI - AIT Calabria had its own initiative on the occasion of the national strike . The comrades present in the square on Sept. 11 distributed leaflets about the strike, met people interested and impressed by the claims expressed by the USI - AIT. Many passers-by seemed to have a lack of information about the strike and many issues related to it. Being on the street, meeting people was a way to get around the logic of centralization and vertical integration. The Fair Work Ombudsman has ordered Dominos Pizzas to pay drivers around $590,000 in back pay. The workers had been underpaid. In 2012, a group of drivers formed the General Transport Workers Association (GTWA), affiliated to the ASF-IWA. The drivers protested against a pay decrease and had other demands towards Dominos. As a result, their pay was mostly reinstated and now the company has to pay compensation for previous underpayment. 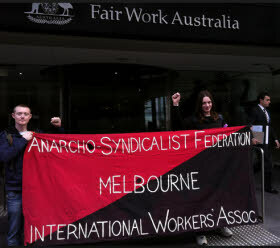 The comrades at ASF-IWA consider this to be a victory for the drivers and an important event for their union. · The staff is tired by the uncertainty created in the current process of bargaining the contract with CESPA. · The City Hall, which will manage the service, does not agree that all the work places, or the same salaries or other working conditions will be maintained. The Public Services Union of the CNT Adra wants to inform the public of the current situation of uncertainty that the workers in the public service of street cleaning and garbage collection in the municipality of Adra are facing. Since all means of dialogue have been exhausted, the staff is left with no alternative but to call an indefinite strike starting July 29. Support Capgemini Workers in Spain against Downsizing! 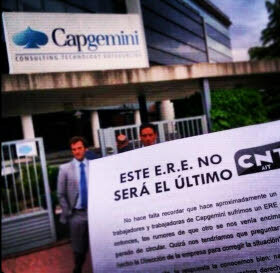 The Capgemini multinational plans to fire 370 workers in Spain. Last week, workers went on strike for 24 hours and decided to have a longer strike starting May 23 if the company did not resign from its plans. 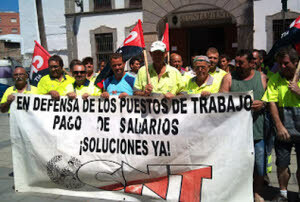 However, the two biggest unions in the company, CCOO and UGT cancelled the strike without asking, hours before the planned assembly of workers. It is unclear what happens next, but our comrades in CNT-AIT in the firm will continue to protest and agitate. Our comrades at Priama akcia have set up an email form for sending protests to the company. Please take a moment to send a mail and let the bosses know what you think of the firings! The links are below. The messages are editable - senders can choose their own Text and Subject if they like. 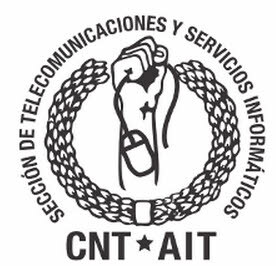 As the result of the call by the Telecommunications and IT Services section of the CNT-AIT Madrid for a Day of Solidarity with the CNT-affiliated members and the workers of Capgemini, several trade unions and European sections of the IWA organized different actions to stop the redundancy plan that the management of this company presented against 370 workers. unions organized as part of a program that will conclude, if Capgemini does not withdraw the redunancy plan, in an indefinite strike starting the 23rd of May. San Raffale will not Fire Workers - A Victory (in part) for the Strike! On May 8, workers from the USI-AIT and USB unions at San Raffaele hospital in Milan went on strike. (See article here.) USI has informed that two days later, at 7AM, after negotiations, an agreement was signed whereby the hospital agrees not to fire the 244 workers. The 66 workers who received their notice will not be fired either. Unfortunately, the hospital still wants to lower salaries by 9% and this was not overturned. So our comrades from USI-AIT do not consider it a victory yet. But it is in fact something that the workers won thanks to their actions and thanks to the determination of the unions who fought, unlike the mainstream ones who gave in. The agreement still has to be ratified at an assembly of workers tomorrow, the 16th of May. On May 8 there was a 24-hour strike of workers from various hospitals in the Lombard region in Italy. 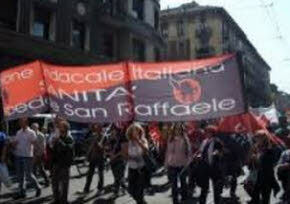 The strike was orginally called by the workers of San Raffaele hospital in Milan organized in USI-AIT and USB unions. Unions from other hospitals, who were in solidarity with these workers, and who have their own claims and concerns, joined the strike. All the workers knew that the same fate of the San Raffaele workers (dismissal) could meet any of them and that they need to fight together. Workers from CUB and COBAS union joined the strike. 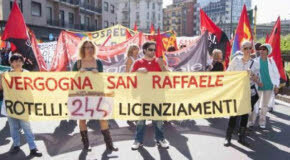 The workers of San Raffaele in struggle are fighting against dismissals in the hospital were the management is planning to fire 244 workers. A month ago, it looked like there was a compromise on this, but the hospital just started to fire people and 66 people were given notice. The strikers tried to go into the building of the local authorities but they met with big police force. The workers at San Raffaele consider the firings as an attack on public health care. This year IWA Days of Action coincided with May Day. On May 1 and the days immediately preceding it, various actions were held by IWA sections around the globe. The following are a few of the reported actions. 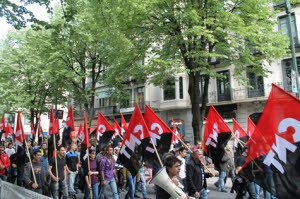 Members of FORA held May Day rallies in a few cities such as Buenos Aires, Neuquen, Rosario and in the Andes region. Members of FORA called on workers to create free unions which will not be part of any compromises and reminded of the tradition of the organization. Activists of COB-FORGS organized a May Day action in Porto Alegre. They demonstrated, handed out leaflets, had a rally with speakers and played music. COB also organized a rally in Araxa, calling for the reduction of the working week to 30 hours without any reduction in pay and for workers' organization outside of the collaborationist unions. After the rally they demonstrated through the city and then had a concert.